I'm working on my Mom's barstools this weekend, so I don't have any furniture projects just yet! BUT I do have a little way to save some money! I didn't come up with this on my own... I ran across it at Infarrantly Creative. 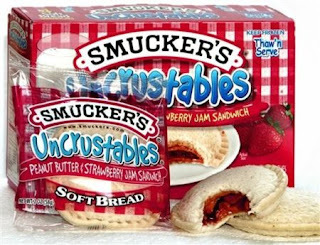 I love Smucker's Uncrustables! I'm always in a rush in the morning and it is so easy to grab one of these out of the freezer, some chips and go! ﻿However, these run around $5 a box for only a few. They're kind of expensive for something I could just make at home. So I just make my own! Try to make these when your bread is fresh - if the bread is dry now it will be dry later. Yuck! I spread the bread out in two rows. Put about a tablespoon of peanut butter in the center of one row of bread. Then glob on a little bit of jelly and smooth it out on top of the peanut butter. Put the naked piece of bread on top of the peanut butter and jelly slice and gently press it down. Now grab your Pampered chef uncrustable thingy and press it down in the middle of the sandwich. It is important not to overfill the bread or you will have jelly and peanut butter leaking out everywhere. While the uncrustable thing is still pressed down I peel off the excess bread. Now you have eight happy little uncrustables. This took me about ten minutes to make. I still have over half the jar of peanut butter and about 3/4 of my jelly left. A little goes a long way! I put each one in an individual sandwich bag, then put all the individual bags into a gallon size bag. Pop it in the freezer and now you have a yummy lunch on the go! I despise crust, so when I'm finished I just throw all of mine away. But you can cut all your crust into little squares, brush on some melted butter and seasoning, them pop them in the oven to make home-made croutons! See what Beckie did with her's! I hope to be back next week with my Mom's barstool makeover! Hi, I came over from Recipe Swap Sundays. I love this idea. Easy too! Oh my, I will admit I LOVE Uncrustables, but they are so stinking expensive! I need to get one of those little press-cutter thingys (that is the technical name....) thanks for linking up! About how long do they take to thaw out enough to eat? Those are a great idea for school lunches! Just wondering if they'd thaw enough by lunchtime. I love your idea and they're so easy to make too. Love this! I lost my pampered chef sandwich press in one of my last moves, I sure do miss it!